Penny’s Bend Nature Preserve is a natural area owned by the U.S. Army Corps of Engineers and managed by the N.C. Botanical Garden. This 84-acre preserve is a peninsula, bounded on 3 sides by the Eno River as it flows eastward towards Falls Lake. 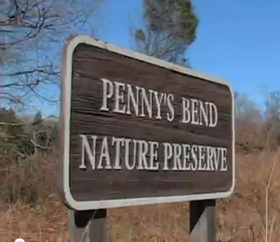 Penny’s Bend supports rare plant species, a distinctive type of forest, and human sculpted open space. We hope you will visit and enjoy Penny’s Bend throughout the year. The underlying rock creates the unique character of this preserve. The bend which gave the name to this area was formed by the Eno River’s eastward flow, which, over time, wore away a hillside of exposed, smooth, dark gray boulders, creating a geological formation know as a diabase sill. Diabase is a type of igneous rock that forms when molten rock intrudes into cracks and fissures below the earth’s surface. The sill is the actual structure of the igneous intrusion, in this case, a horizontal layer of diabase rock. This sill was formed about 225 million years ago when the continents were separating to form the Atlantic Ocean. The intrusive volcanic rock is hard and very resistant to erosion, compared to the surrounding Triassic sedimentary rocks. Consequently, the Eno River is deflected and turns southward, flowing around the diabase backbone of Penny’s Bend. As the Eno encounters softer material, it flows eastward, and finally, northward, forming the eastern boundary of the Preserve. 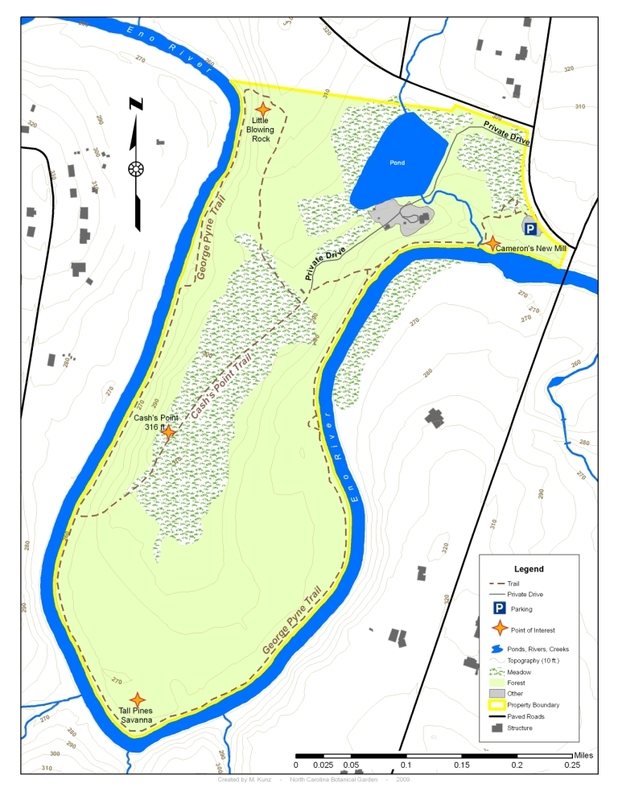 For more info about the geology of Penny’s Bend, please visit the N.C. Geological Survey’s “A Geological Adventure Along the Eno River“. The unique plants of Penny’s Bend grow in soils derived from the diabase rock. These soils -Iredell on uplands and Wilkes sandy loam at the base of the slopes- are quite different from typical Piedmont soils. Unlike surrounding acidic or sour soils which have a low pH, Penny’s Bend soils are basic, or sweet, with a high pH. Sweet soil is ideal for certain kinds of plants typically found in other regions of the United States, particularly in the prairies of the Midwest. 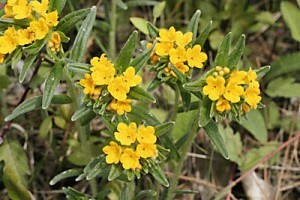 Blue wild indigo, a handsome member of the bean family with bright blue flowers, and hoary puccoon, a small plant with bright yellow-orange flowers, both grow in Penny’s Bend but are not common in North Carolina, each having fewer than 30 locations in the state. Many of the unusual plants at Penny’s Bend make excellent perennials for the home garden. Experiments at the preserve enable us to learn more about the germination and growth requirements of these beautiful and rare plants. 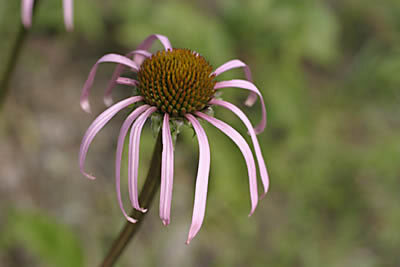 A recent inventory of botanicals at Penny’s Bend found more than 461 different plants including those that are unusual. Remnants of pre-European settlement grasses still exist at the bend and current management efforts are aimed at reestablishing a mature grass prarie. Fire is used as a tool in this effort. To view a slide show of a recent controlled burn at Penny’s Bend, click here. The river, the hardwood forest bordering it, an upland pond, and an open pasture provide many habitats for wildlife. Great blue herons and green herons feed in the river and pond. Mice and shrews living in the pasture are prey for red-tailed and red-shouldered hawks and barred owls. Cottontail rabbits, foxes, deer, raccoons, and a variety of reptiles and amphibians also make their homes in Penny’s Bend. As the surrounding privately owned land becomes more urban in character, many animals living in those areas will be displaced. Hopefully the Falls Reservoir lands and the protected park lands along the Eno river will become a sanctuary for some of these displaced wild animals. In 1890 Paul C. Cameron commissioned D. G. McDuffie to map his plantations, Stagville, Fairntosh, and Snow Hill. Within the Snow Hill properties on that map, the curious peninsula on the Eno River was designated Penny’s Bend, and this is the only documentation of the name that has persisted by word of mouth to the present. Penny was probably a family name, but we still do not know who Penny was, nor why this large meander was given that name. In 1836 Duncan Cameron, Paul’s father, built Cameron’s Mill- a grist and sawmill by the small waterfall and ford on the northeast turn of Penny’s Bend (just upstream from the present Old Oxford Road crossing). Floods repeatedly damaged the mill buildings, resulting in the need for continual repairs. Paul Cameron’s son-in-law, George P. Collins, rented the mill from him and was probably the last to operate it. Bordered by the River, the rolling grasslands of Penny’s Bend have provided ideal pasturage for livestock from the Cameron’s time to the present. Two hundred years of agricultural and other human uses have made an impact on the ecology, making this a unique and remarkable preserve.